Tonight I am in the palace hotel marveling at the crystal chandeliers; marble pillars; candelabras; and high, stained glass, arched ceiling. I sit in the corner of a comfortable, blue banquet couch; I touch it’s soft, yet strong fabric and notice golden rivets adorn the borders. I feel natural on this couch. I am wearing leather boots that I bought in Spain, and a long shawl. My hair is shiny and my makeup is soft. Looking at me, nobody would imagine that last week I slept in a friend’s van. The waitress brings me Organic Emperor’s Jasmine tea in white set. The silver utensils are polished to perfection — I see the stained glass ceiling reflected in the curvature. A revolving tea strainer rests in the cup. It is so ingenious that I’m surprised I haven’t seen one before. Most of all, I love my longtime friend, Torin Martinez, who is finger picking his amplified acoustic guitar in the middle of the salon. Just a moment ago, he was improvising on the piano and singing — all while the guitar played harmony. The sound is rich and layered, and without looking, I’d think there were at least two or three people playing. But Torin performs solo; he uses pedals to record the guitar and then plays over the loop. With this technique, Torin turns himself into a one-man band. And his voice — it’s silky and smooth like a fine chocolate. Artistic patronage is as old as history, and Torin finds himself in a fruitful situation similar to many of the greatest artists (and glamsients!) of all time. Although he is not directly funded by a nobleman, the Palace Hotel supports Torin, allowing him the resources to pursue his own musical career composing and producing R&B and Hip-Hop. 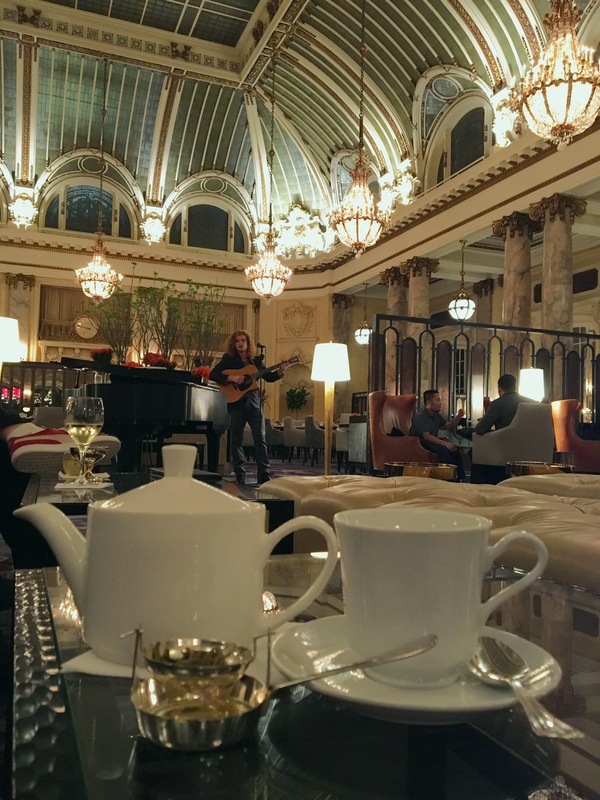 If you’re in San Francisco, the palace hotel is worth a visit, especially when you can catch Torin play there every weekday from 5-9.